Wind and solar farms are known to have local effects on heat, humidity and other factors that may be beneficial – or detrimental – to the regions in which they are situated. 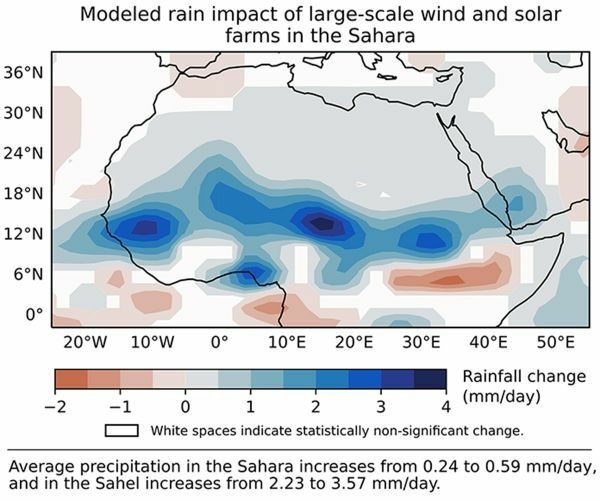 A new climate-modeling study finds that a massive wind and solar installation in the Sahara Desert and neighboring Sahel would increase local temperature, precipitation and vegetation. Overall, the researchers report, the effects would likely benefit the region. The new study, co-led with Eugenia Kalnay and Safa Motesharrei at the University of Maryland, focused on the Sahara for several reasons, Li said.